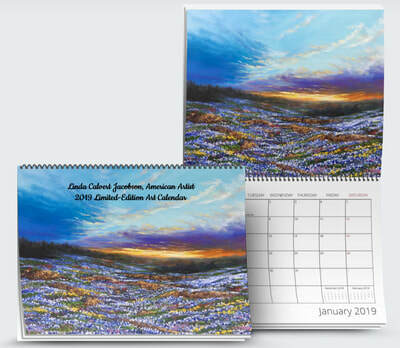 Linda's 2019 Limited-Edition Fine Art Calendars are here! If you love Linda's artwork, here's your chance to enjoy it year around with her 2019 limited-edition calendar. She has chosen 12 of her favorite paintings to showcase in this colorful calendar. The high-gloss finish makes the colors pop and the wire spiral binding allows it to lay flat on the wall or fold neatly to keep on your desk. Measures 8.5 by 11 folded and opens to 11 by 17 when hanging. THE COST: The 2019 Limited-Edition calendars are $17.95, plus $1.48 sales tax for a total of $19.43 each when picked up in person. NEED THE ORDER SHIPPED? In order to keep it simple, if you'd like to have your order shipped (any address in the U.S.), the price including postage and handling is $22.50 per calendar, plus 8.25% sales tax. Orders will be mailed through the U.S. Post Office. WANT MORE THAN JUST A FEW? Need a large quantity (10 or more) for gifts or, if you are in business, to resell in your gallery or gift shop? Let's chat! Please contact us if you are interested in ordering 10 or more calendars (e-mail linda@wildflowerartgallery.com or call 830-221-7676). Use our "Buy Now" button powered by Pay Pal. You do not have to have a Pay Pal account and you can use any credit card of your choice. Price is $22.50 plus tax per calendar (shipping/delivery included). Please note that you may see the business name as "casa de linda" on your invoice and/or credit card statement. Mail in your order with a check made out to Linda Calvert Jacobson. Your total is $22.50 times however many calendars you're ordering. Be sure to include your phone number, e-mail and the full address where you want your calendar order shipped. 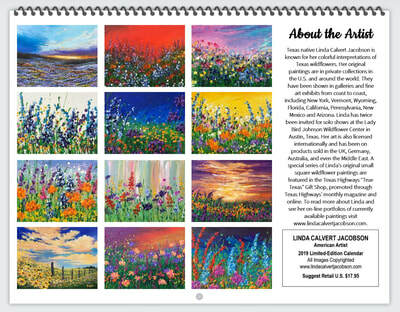 Visit Wildflower Art Gallery in Wimberley (open Wednesdays-Sundays) and pick up your calendar in person. To reserve your calendar for pick up in Wimberley so you can be sure it's available, send an e-mail to David@WildlfowerArtGallery.com or give him a call at 830-730-7880.